In case you can’t get enough of festivals this September or you are simply not into arts, here is something different. 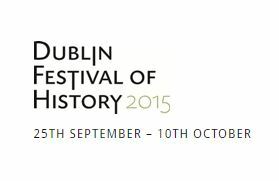 Dublin Festival of History runs from 25th of September till 10th of October. I will be honest, when I started writing this post I thought personally I might just write this one off, but now I’m chaotically trying to schedule my days to fit at least some of the very cool things on their program. The festival is meant to be for all ages, so drag your little ones away from their iPads. There will be a cool walking tour called A Child’s view of Dublin life through the ages. Some fresh air never does any harm. And it’s educational! If I was a kid I’d also love to go for Dressing for History – Costumes and Stories with Laura Thorp. There are also going to be Solve the Mystery events at Cabra and Rathmines libraries for kids aged 7-11. I’m sorry for a long list, but I really couldn’t choose, they all are awesome subjects!